First off - Welcome back to Team Jenkins Motorsport! And also a HUGE warm Welcome to 4Mance Automotive , Prestige Tuning & Motorsport and DKM Fabrication who are new to the Team and have come on board for an action packed 2016/17 Season of Events with us! Both myself and Ben are super excited to have you all on board for this season of events - and hope to do everything we can to showcase your brands over the next couple of years! To start off - After our recent invitation to compete over at Sydney’s Eastern Creek Raceway for the World Time Attack Challenge - Many of you may have seen or heard that we had a driveline lock up to which put us into the Pit Straight wall at a matter of speed , causing a large amount of Damage to the front of the newly supported 4Mance Automotive S15. This unfortunate incident then disabling our S15 to compete any further due to the strut towers being slightly moved over as well as the Engine moving over to cause the driveline to be out of line. A huge disappointment for our Team after what showed was a very strong car on the few test laps that we did. On a more positive note - We were fortunate enough that our title Sponsor for the Event - 4 mance Automotive , managed to organise us another one of their sponsored competition Vehicles to drive for the remainder of the weekend - a 1JZ Powered BMW E46 4 Door. a HUGE Thank you has to go to entire 4Mance Automotive Team for organising and helping us with their BMW - Troy was stoked to be able to continue the weekend and put on a show for the Sponsors and crowd. Once we got back to New Zealand , the Team started making a plan to what was needed to get the Team Jenkins S15 back on the track again and ready for Round 1 of our New Zealand based Series - D1NZ. After speaking with our Sponsors and starting to plan out to what would be a massive 4 weeks to get the car mobile again - We came up with the idea of making a Video Series of each step along the way to show our Fans what went into resurrecting our S15 in the tight time frame we had to use. These mini video’s - filmed by one of our Crew members , Joel McDowell , proved to be a success with over 8 thousand views in 2 days on each of the videos. Adding to this we had messages pouring in to help in some way or another to get us back on track in 4 weeks. 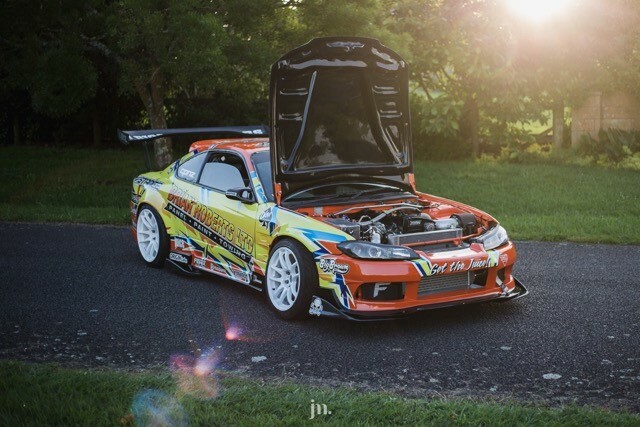 Here we would like to thank each and every one of you to which helped us repair , fabricate , paint and graphic the TJM S15 in the smallest of time frames. 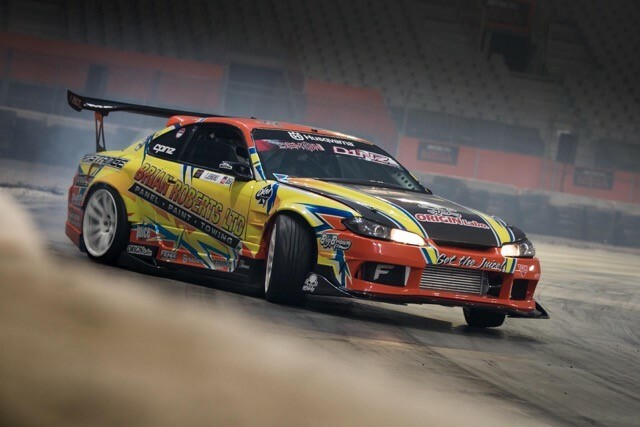 Upon completion the S15 was loaded up and made the long journey down to New Zealand’s South Island for the first event on our New Zealand Calendar - The D1NZ National Drifting Championship Round 1 at Dunedin’s Forsyth Barr Stadium. Leaving on the Sunday , with only our Brian Roberts Towing Nissan S15 Silvia in tow, since Ben’s Brian Roberts Towing S13 had been containered over from the recent Waimate 50 Event we did. Arrival - Dunedin City. Here we met with the most creative track to date - a Concrete Jungle within a HUGE Football Stadium - Forsyth Barr. 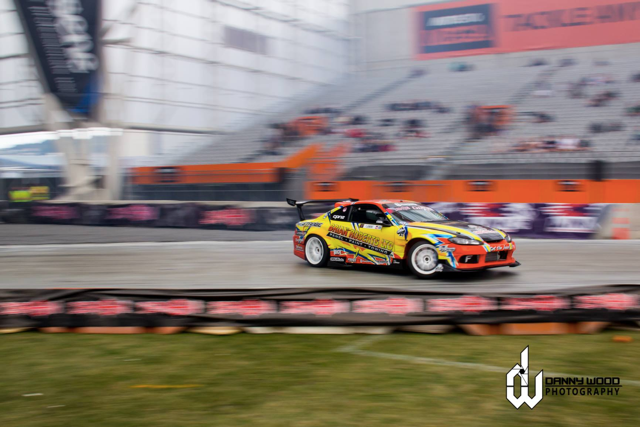 D1NZ Organisers had totally out done themselves on this one , with a massive customised track under both lights and a stadium roof, Meaning the weather would not be a factor into our weekends schedule. The Thursday Morning we travelled to the Airport to pick up the remainder of our 12 Strong Crew and drove back to the Stadium to start setting up our Pits for the next few days of drifting. Troy’s S15 felt great after what was a large rebuild of the front end. Quickly getting into the swing of things - Both cars felt good coming into qualifying. But , with the large amount of clutching, hand-braking and throttle control , we kept breaking half shaft axles to which connect the rear wheels with the differential. Both of our TJM Silvia’s had half-shaft and diff breakages throughout the weekend , but we were definitely not alone with this issue. The small jump at the start of the section , along with the changing surfaces - showed to be ‘shocking’ the driveline and eventually breaking at its weakest point. Many other drives sustained the same issue throughout the 2 day event. This issue to which put Ben out of one of his Qualifying Laps due to breaking a shaft as he started his first of 2 Qualifying Laps. Heading back out once our Crew remedied the issue - Ben then drove the car 110% to ensure he gained maximum points off his 1 lap he had to use. Hugging the inside clip on the later part of the section , Ben unfortunately put a wheel off between the concrete and the fence to which pushed his car off course and gave him a zero score for the weekend. Troy’s Pro Qualifying Session commenced later that night with 2 laps to secure his spot into the battle order. Troy put down a safe run to start , to ensure he was in the game for the Sunday. Starting his 2nd run , he put everything into it which showed to be his better lap of the 2 - and putting his 11th out of 36 cars for the weekend. His first battle on the Saturday night would put him up against Jacob Hakaria in a 2JZ Powered Laurel. Troy winning this battle easily and commencing onto Top 16. It was here that Troy was partnered up with Daynom Templeman in the 2JZ Powered E46 BMW. A Battle to which he unfortunately lost after what was a VERY close battle. Speaking to the judges after - they were wanting a “One more Time’ battle. But time would not permit this to happen. Giving Troy a Top 15 Finish for the weekend and some decent points for the First Round of the D1NZ Championship. Preparation on both cars has commenced leading up to Round 2 just after Christmas and New Years - on the 6th & 7th of January 2017 down at Manfield Raceway in the lower North Island. We have booked in to do a Test day at our Local Track - Hampton Downs Raceway over the break on the 28th of December to play with our STANCE USA Suspension Setups to try and critique our data for faster tracks leading into Round 2. We also wanted to take this opportunity to THANK YOU ALL for a HUGE 2016 - and a very Merry Christmas and Happy New Year to you and your families. Without each and every one of you , we could not be doing what we do! So thank you from both Troy , Ben and the Team here at Team Jenkins Motorsport. Again - Merry Christmas and a Happy New Year to you all!